Page title: Can Choreography Help Us Understand the Refugee Crisis? Can Choreography Help Us Understand the Refugee Crisis? Martha Schabas is the dance critic at the Globe and Mail. Her writing has appeared in the Huffington Post, Elle Canada, and Hazlitt. Flight Pattern follows the journey of a group of displaced people in their search for asylum, zooming in on the experience of a particular family. It opens with a bedraggled cluster of dancers moving under dim light on a stage, constrained by barriers. The dancers’ clothing is dishevelled, and their controlled, staccato gestures suggest exhaustion and despair. We get the feeling that these figures have crossed many miles, over many months. There are no allusions to the Rohingya of Myanmar or the lost boys of Sudan; Flight Pattern could be about the plight of any group of refugees (Henryk Górecki’s Third Symphony, to which the piece is set, uses text that was scrawled on the wall of a Second World War prison). But for the audience watching the premiere in March 2017, the overlap between what unfolded on stage and actual world events pointed our consciences naturally toward Syria. This is far from the norm in the world of contemporary ballet and dance, where there are a few predominant trends: choreography that’s essentially abstract with, perhaps, light inflections of character or theme; choreography that’s concerned with the sheer form of the steps; concept-driven choreography (for instance, a piece that uses everyday, pedestrian movement to explore an intellectual question); and choreography shaped primarily by plot—versions of the traditional “story ballet.” Pite melds the best of each school, using narrative arcs and choreographic abstraction as a way to explore topical material you rarely see in dance at all. It’s an approach that gives her work a unique relevance and clarity. The forty-seven-year-old British Columbian has become one of the globe’s most sought-after choreographers. In the past two years, she’s had world premieres at two of Europe’s most prestigious companies: the Royal Ballet (where she was the first female choreographer to have a piece commissioned for the main stage in eighteen years) and the Paris Opera Ballet, where she debuted The Seasons’ Canon. Pite runs her own company, Kidd Pivot; is an associate choreographer at Nederlands Dans Theater; and holds associate artist positions at Sadler’s Wells in London, England, and the National Arts Centre in Ottawa. Pite’s ability to create material that is as thematically concrete as it is emotionally affecting has helped her win over people who normally find dance alienating and esoteric or, alternatively, too decorative and light. Audiences “understand” what’s happening in a Pite creation the way they would have a logical handle on the context and emotional stakes of a challenging play; critics sometimes refer to Pite’s work as “dance-theatre.” But as a choreographer, her vocabulary is ultimately non-representational, meaning she can evoke more slippery tones and moods than a playwright generally can. Her pieces often place us in a world ruled by instinct and the unconscious, settings more dreamlike and intimate than naturalistic theatre, but because of her work’s structural rigour and clarity, we know how we got there; we never feel lost. Nowhere is Pite’s talent for wielding emotional and conceptual power more evident than in Betroffenheit, which had its world premiere in Toronto in 2015. A collaboration between Pite and playwright-performer Jonathon Young, of Vancouver-based Electric Company Theatre, Betroffenheit deals with a visceral and—unusually for dance—autobiographical event: the death of Young’s teenage daughter and two of her cousins in a cabin fire in 2009. Young was in a nearby cabin when it happened and subsequently struggled with profound trauma and addiction. Young asked Pite to direct the project because he wanted to lean on her choreographic skill; he knew language could only go so far to express the images he had in mind. As they started to discuss how to stage the internal phenomenon of psychological anguish and how to zoom out to a more universal question of suffering, the piece became increasingly physical. They devised a two-part structure that let them blend the abstract and the literal into a staggering expression of loss that has moved audiences around the world. The first part of Betroffenheit,which combines choreography and text spoken via voice-over, shows the protagonist (played by Young) trapped in an industrial room where a talking surveillance system tries to save him from his guilt and despair. Eventually, he succumbs to his addiction, and the dancers, who’d been crossing the stage to taunt him, become the hallucinations of his high. In the second part, which uses less voice-over and more choreography, the industrial room dissolves into a nightmarish open space that suggests the desolate landscape of his grief. I have seen Betroffenheit twice, at that premiere and then the following winter. Both audiences responded with an almost stupefying emotional intensity, far beyond any standing ovation I’ve ever seen. Betroffenheit went on to win Britain’s Olivier Award for best new dance production and had critics across the world scrambling to express how it redefined what we expect from dance. 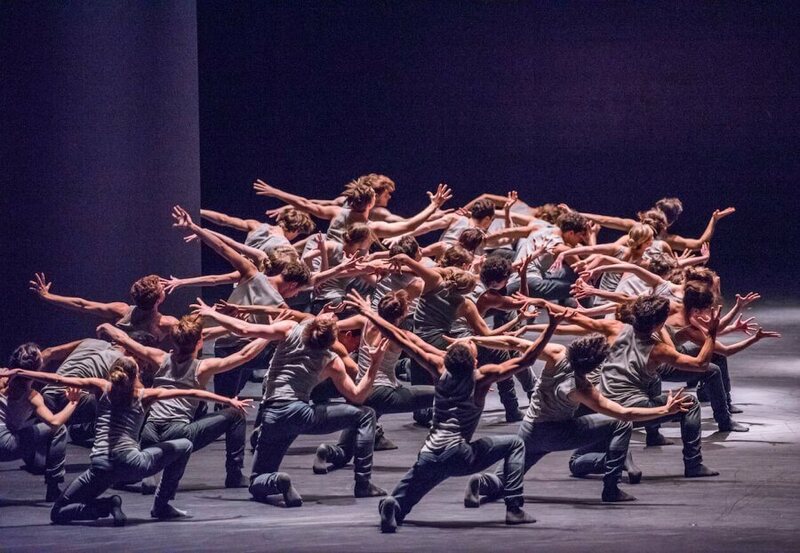 Pite’s choreography relies on dramatic imagery and suspenseful momentum, underpinned by a deeply rooted sense of flow. The dancers appear so elastic at times that their bodies can look boneless, with every inch of a leg articulating as it extends upward or a back undulating like a ribbon of smoke. Pite’s dancers are always immaculately trained, but they also possess the artistry that lets them work against their technique when the narrative calls for it, appearing ungainly, reactive, flawed. Non-dance critics often note martial-arts inflections in Pite’s propulsive partnering and lifts—I’ve heard people say it reminds them of the fight scenes from the film The Matrix. The postmodern American choreographer Yvonne Rainer famously wrote that “dance is hard to see,” because it’s gone as soon as we recognize what we’re watching. But there’s so much detail in Pite’s style, so much of a sense of process made visible that, at times, it feels as though we can see more than what’s in front of us. The movement stretches our visual comprehension of time—we get flashes of the in-between, as though we can make out the pixels. Pite started to choreograph as soon as she began her dance training, at the age of four or five. At the Vancouver coffee shop, she pulled up a black-and-white photo on her laptop: a row of little girls standing at the barre in leotards. Pite is recognizable as the long-limbed, blond girl in the middle. Growing up in Victoria, she studied at a small, local studio, and by the time she was thirteen, she was presenting her own solos in the young choreographer’s division at local competitions. Even then, her creations were never abstract. “They always had a theme or a little story,” she told me. Her teacher gave her the keys to the studio so she could work on her own pieces on the weekends. She choreographed the dance sequences for her high school’s musicals and organized improvisational dance sessions with her friends. Despite not having trained at a full-time ballet school, Pite was offered a contract with Ballet BC straight out of high school, and she joined the company at seventeen. It meant working overtime to get her technique up to scratch, but she still managed to find opportunities to choreograph, making pieces for her colleagues and accepting commissions from companies across Canada, including Ballet Jörgen, Alberta Ballet, and Ballets Jazz de Montréal. By the time she was twenty-five, she was known throughout the country as a bold emerging choreographer. Pite had always planned to have her own company, and when she returned to Vancouver, at the age of thirty, she founded one that drew on the trust and intimacy that she had experienced in Frankfurt. Over twenty-five dancers have been part of Kidd Pivot over the course of its sixteen years, and she gets to know them well, relishing the long-term relationships that develop and the understanding of process and purpose that comes with them. It means that, for a project such as Betroffenheit, she shows up at rehearsal with no choreography prepared in advance and builds it with her dancers in the studio. There’s a feedback loop between bodies and theme; elements of the choreography come out of improvisation and a lot of trial and error. She works very differently when she’s commissioned by big ballet companies, showing up with “truckloads” of choreography already built: there isn’t time to teach new dancers her aesthetic. Instead, she pares down her movement vocabulary and focuses on creating evocative ensemble work. “By using simpler physical structures over a large number of bodies, I can get the kind of complexity that I’m interested in. It’s unlikely that I’m going to get that kind of complexity in an individual body in the time that I have.” So the sinewy and sentient detail you might see in a Kidd Pivot dancer is transferred onto the collective; it exists, instead, in the expansive images she can build with thirty-plus dancers on stage. When she’s immersed in a particular mood or physical idea, Pite finds it disruptive to shift gears, so pieces created around the same time can look like siblings—I’m often reminded of Picasso’s colour periods. She considers some pieces to be companions to others; In the Event, from 2015, was created midway through Betroffenheit’s rehearsal process. To me, it looks like bonus footage from the second half of Betroffenheit, unfolding in a post-disaster landscape where the characters grapple with the possibility of transcendence. Her recent Paris and London commissions both present staggering images of humanity en masse, bodies upon bodies tangling in and out of collective shapes, with dozens of bare arms sweeping in the same, and then in counterpoint, directions. Both use a step I’ll term the “clockwork head,” in which heads tick back and forth on a vertical arc, suggesting an automated response to desperation. They’re also both set to emotional classical scores; The Seasons’ Canon uses a gorgeous reworking of Vivaldi’s Four Seasons by British composer Max Richter. But unlike Flight Pattern, Canon is fundamentally a non-narrative piece and more technically demanding in its use of pas de deux. It feels a bit like Flight Pattern’s mysterious, and more inscrutable, older sister. In order to help herself cope with the intensity of her subject matter, Pite decided not to portray any actual violence but to focus instead on the idea of people stuck in limbo. She tried to recreate the sense of a holding area, a checkpoint or a camp—a place where the refugees are infinitely relieved to have escaped one situation but have no idea what will come next. “They haven’t yet entered the next chapter of their lives—they don’t know if they ever will,” she says. When we met months later in Vancouver, I asked Pite whether Flight Pattern marks the beginning of a more explicitly political turn in her career. “Right now, what else can we do?” Pite said. “I don’t really feel like I want to spend time doing anything else—I’m so privileged to have the opportunity to make art, and I don’t think that it has to be activism. But I think it has to reflect…no,” she cut herself off and paused. “I don’t think art has to do anything. I think for me, right now, it’s all I can do. It’s all that I’m interested in—trying to reflect what’s happening in the world around me at this moment. It feels necessary to me.